A year ago, CMKOS launched a campaigned with a clear and resolute slogan: “End of Cheap Labour”. The purpose of the campaign was to encourage trade union negotiators and give them arguments supporting their demands of wage growth. 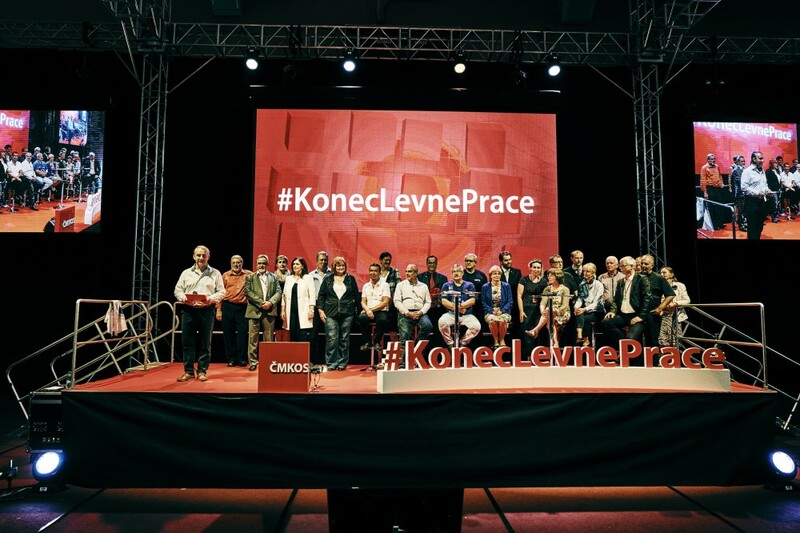 On September 7th, 2016 CMKOS organized a manifestation meeting in Prague attended by nearly a thousand trade unionists from all regions and sectors. International support was manifested by Jozef Kollár, president of the Slovak trade union confederation, Catelene Passchier, vice-president of Dutch FNV, and Marcus Schlimbach from DGB. What are the results of the first year of the CMKOS’ campaign? The average wage grew by 4.4 % (3.9 % in real terms), which is the highest increase in 9 years, and trade unions played an important role. CMKOS is raising awareness about the wage convergence, which is happening at an unacceptably slow pace. The calculations from last year show that if the Czech wages grow the way they did in the previous ten years the Czech Republic will catch up with Germany in 100 years. This is why the End of Cheap Labour campaign continues. CMKOS recommends its negotiators to demand 5 – 5.5 % wage growth in 2017. We don’t want to belong to the worst paid employees in the EU! This slogan was at the launch of the Czech-Moravian Confederation of Trade Unions’ long-term campaign “End of Cheap Labour” against low wages and salaries in the Czech Republic. The goal of CMKOS’ campaign is to get out the Czech economy from the persisting concept of low wages. The trade union campaign has inspired and positively influenced collective bargaining with companies for 2016. The growth of the median wage is close to 6.5 per cent this year, which is the 8 years maximum. The Government rectifies income of employees paid by the state by regular increasing the minimum wage and raising salaries in public sector. This should be an inspiration for employers in private sector. CMKOS deems necessary to highlight the importance of the real wage – that is what the employees actually buy with their wages. Household consumption is a key driver of GDP growth. It contributes by more than 50 per cent to the GDP creation. That is why the whole society needs to be interested in wage increase which enables employees to contribute more to the growth of Czech economy. In the upcoming round of collective bargaining for 2017, CMKOS recommends to negotiate, where economically suitable, a wage growth by 5 – 5.5 per cent. CMKOS 2019, All rights reserved.